A few days ago I had an interview with Krishnadas from Holland. The attached article shares his experiences with Suhotra Swami during his first travel to Bulgaria and Romania. On 9 July 2018 I interviewed Krishna Das with regard to his experiences of traveling with Suhotra Swami in Bulgaria and Romania. 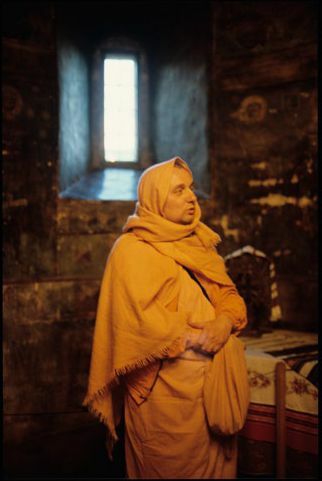 Krishna Das, a disciple of Harikesa Swami, served as head-pujari at the German Nrisimha farm between October 1986 and November 1991 as a successor of Krishna Kshetra Das. 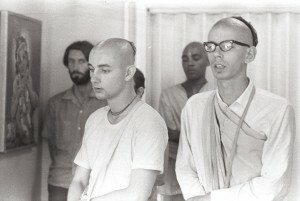 He and Suhotra Swami, were close friends and after the fall of the Berlin Wall, when Suhotra Swami decided he would like to preach in the East, Krishna Das agreed to collect enough money to buy a vehicle. He bought a J5 Peugeot van and converted it into a camper. 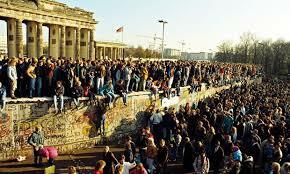 At the end of July 1990 they left Germany and entered Austria. Below is a transcript of my interview with Krishna Das. “A few months after the revolution in Timisoara and the execution of the Communist Party General Secretary, Nicolae Ceausescu (ending a forty-two year communist rule), we left Germany and traveled through Yugoslavia, Romania and Bulgaria. In Bulgaria, especially in the capital, Sofia, we found the people to be genuinely receptive to our message. We went from Sofia to Plovdiv and from there to Constantia and other areas around the Black Sea coast. Suhotra Swami was the first sannyasi to preach freely in these countries and within a short space of time he had gained a considerable following. We held many preaching programs and distributed books in English and German. Devotees offered friendship in the form of lots of tomato ketchup and bottles of rose water. 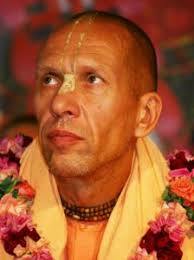 he had a large following in Bulgaria and he always gave brilliant Srimad-Bhagavatam classes. We were sleeping in the same room and I observed that, when he awoke each morning, he spent about twenty minutes reading Srimad Bhagavatam and making notes in tiny writing. After this he took a shower, chanted rounds and attended a morning program in the devotees’ house where we stayed. Then he would give an amazing class based on these notes. Along the way we met with Avinascandra Prabhu, (now Bhaktivaibhava Swami), who was preaching in the Czech Republic and he joined us on our trip. 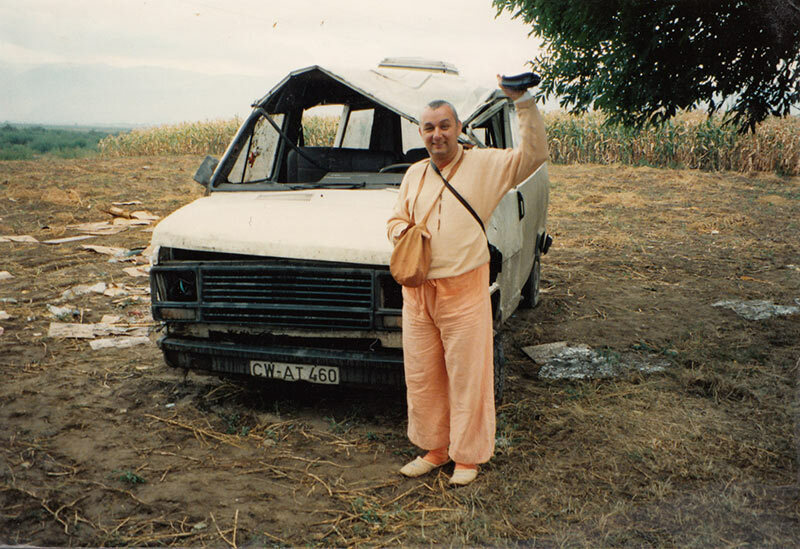 While traveling through the Transylvanian mountains Avinascandra Prabhu agreed to drive the van. Along the way we hit poor weather conditions and Avinascandra, not being used to driving this van, soon faced difficulties—he lost control of the steering wheel and the van veered off the road, crashed and then turned over. Avinascandra and Suhotra Swami were hospitalized. The accident had such a major effect on Avinascandra’s health that, for a while, I was even spoon-feeding him. Suhotra Swami had also been badly affected and he was treated for deep shock. They spent some time recuperating, after which, a devotee drove us to Vienna. 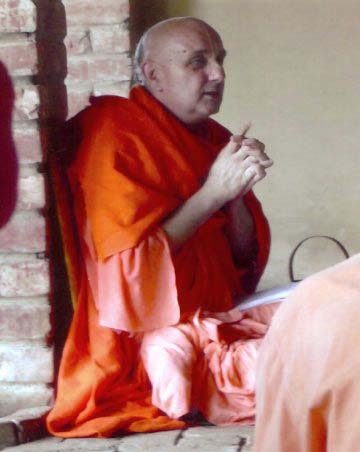 Although Suhotra Swami voluntarily agreed to step down from the sannyasa ashram before his passing away in Mayapura on 8 April 2007, he is addressed as Suhotra Swami in this article as he was acting and recognized as a duly initiated sannyasi at the time of the events. Please accept my humble obeisances at your feet. Shrila Prabhupada ki jai. How wonderful that you have remembered us. Thank you so much for the article. I knew Suhotra Maharaja from the day he joined up at ISKCON Press. He had purchased a BTG on the streets of Detroit, and he figured that whoever printed the magazine must the the ones to meet. So he hitchhiked 500 miles to Boston. There he figured that I had the worst job (in the basement of the funeral home, that was now the Press) so he offered to become my assistant. He never actually joined me for more than a day or so, because he wanted to perform the yagna. He has a lot of space in my compiliation THIS IS MY HEART about ISKCON Press. I hope that Your Holiness will find time to have a look. He has given remarkable guidance to my better half, and he has really transmitted the parampara expertly. Though he has left our vision, he remains a living example that Shrila Prabhupada can empower his disciples as his representatives in the capacity of diksha gurus. I had not seen Suhotra Maharaja for some 35 years or more when he told Abhaya Mudra Dasi about me, and how I was in the plays back in Boston where he joined. In that way he brought us together. I was driving a cab in San Francisco when a married couple of devotees from Moldova who were also drivers told me of his departure. It came upon me as a flash and served as a calling. I left everything soon thereafter by his blessings. It should be pointed out that His Holiness never actually left sannyasa. 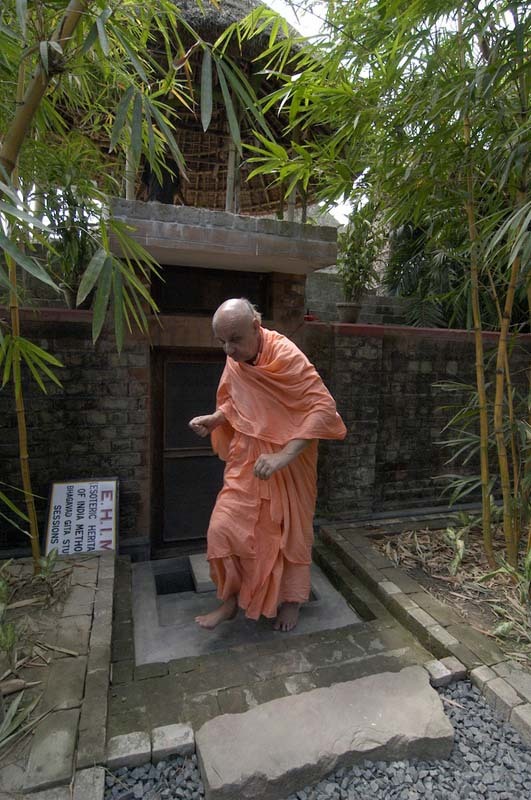 He was tired of being called on the rug by some GBC members and questioned in an abrupt way, so he appeared to leave sannyasa by putting on a brahmachari dhoti and calling himself vanaprasthi. However, he increased his austerities, i.e. sannyasa ashram, and moved into a hut in Mayapura. His so-called departure from sannyasa was to convince non-committed initiates to leave him. That was obviously because as a mystic he was planning to depart yogi-style which only the most advanced and fully realized personalities can accomplish. Two days later he was gone. It was very short sighted of the authorities to order his body for cremation since he was a genuine sannyasi whose “leaving sannyasa” was simply for fooling the faithless. It was unfortunate that those in charge could not understand the ploy of this brilliant renunciate. I am sending your kind article along to the Suhotra Swami website in-charge, Shriman Vidyagati dasa Adhikary Prabhu in Prague. I request Vidyagati to place it on our page on that site. I was very happy to read your reply. Suhotra Maharaja has also been a great inspiration for me. He used to visit regularly Flanders early 1990s. I invited him to our Nama Hatta in Ghent where he stayed a few times.